The Pet Photography Essentials Package (No Body) - Canon includes gear necessary to help capture the animal friends we cherish and adore. The Canon EF 50mm sports a super large aperture that allows the user to shoot hand held in almost any lighting situation, while the 180° angle of view of the Canon EF 15mm Fisheye results in unique and intriguing effects and the short minimum focusing distance of 8.4" gives new meaning to closeup shots. 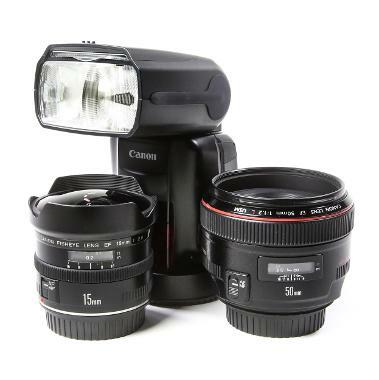 This package also comes with the Canon 600 EX-RT to assist in creating the right lighting you need. Canon 600 EX-RT works as a stand-alone flash unit or can be connected to your camera via transmitters/sync cables. Click here for recommendations.